Every so often you’ll need to update your auto attendants and don’t really want to spend a lot of time on it. 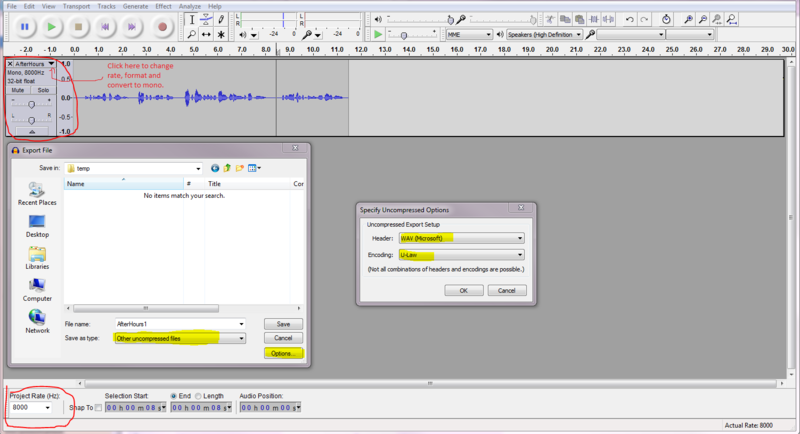 Here’s a quick way to use Audacity to make or edit auto attendant menus. You can take these settings and convert them for use in other sound recording programs, it’s basically the same idea with any of them. It’s not terribly obvious how you save a file in this format in Audacity but it is there. Why ShoreTel won’ t go with an MP3 format which would be simpler to work with, I have no idea. Alternatively they could publish an open source .WAV converter for this purpose to package with their server software. 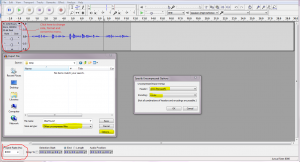 Here’s how to set up Audacity to save in a format that ShoreTel will accept. You can either use this on a track you’ve recorded directly into Audacity, or one you’ve recorded elsewhere (or found on the internet). Pretty much anything Audacity can open can be converted like this. Step 1 – Set the sample rate to 8000hz. Click on the track’s title in the left hand corner (it has an X next to it and a filled in black arrow pointing down). Refer to picture. Click on “Set Rate” and select 8000hz. Step 2 – If it’s a stereo track, click on the track title again and click “Split Stereo to Mono”. This will separate the stereo tracks. Just delete one of the tracks if they are identical. Step 3 – You can leave the Sample format as 32bit Float. This doesn’t seem to matter much. Step 4 – Now make any edits you need to make. Step 5 – Set the Project Rate down at the bottom to 8000hz. I don’t know why you have to do this in two places but it seems to work better if you do. Step 6 – Click on File, then Export. Change the Save as Type to “Other Uncompressed Files” and click the options button. Select “Microsoft” under header and “U-Law” under encoding. Click OK. Step 7 – Fill in any meta information you want and click OK. This should let you import the file directly into the Auto Attendant Menu. This works well if you want to make a bit more professional recording than sitting someone on a phone. I’d recommend not getting too fancy with your audio as this process does reduce quality. Works slick – it’s always been a trial getting stuff into ShoreTel – this makes it a lot easier – thanks! Thanks! I’m sure this saved me a ton of time figuring this out for myself. Next PostNext Fixing Outlook Freezing with ShoreTel.